New York City law prohibits large retail stores from leaving their doors open while their air conditioners are operating — a measure intended to conserve energy, cut air pollution and conserve power on days of peak demand. 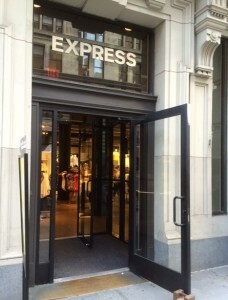 The Express store at 5th Avenue and 18th Street in Chelsea, as part of a chain of five or more stores in NYC, is also required to comply with this statute. But its doors were wide open, with AC operating, when temperatures soared on July 20th and 21st. Stores in New York City continue blasting their air conditioners with doors wide open, even on the hottest days when electric reliability is in jeopardy. NRDC’s Eric Goldstein explains. Many New York City retailers are continuing to blast their air conditioners with store doors wide open this summer, seven years after the New York City Council enacted legislation intended to curb the wasteful practice. A recently completed NRDC sampling of almost 300 retail establishments in four Manhattan and Brooklyn neighborhoods found that more than 1out of 5 were propping their doors open, sending waves of cold air onto the sidewalks on days when temperatures soared and demand for energy strained local supplies. The informal NRDC survey was conducted earlier this summer along commercial strips in the following neighborhoods: Chelsea (5th Avenue from 14th to 23rd Streets); Harlem (125th Street from St. Nicholas Avenue to Malcolm X Blvd. ); the Upper West Side (Broadway from 86th to 96th Streets) and the Midwood section of Brooklyn (Kings Highway from East 16th to East 11th Streets). For years, energy experts have warned that the practice of leaving retail store doors open with air conditioners shooting gusts of cold air onto sidewalks during the hottest summer days – presumably to lure customers into the stores – has adverse consequences. 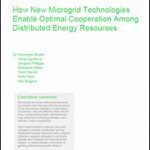 For one thing, it wastes energy and increases utility costs for customers. The Long Island Power Authority has estimated that leaving store doors open while air conditioners are operating can boost electricity use at those establishments by 20 percent to 25 percent. And according to Con Edison, businesses that prop their doors open during the summer months can increase their electricity bills up to $1,000. The open door practice also increases the risk of brownouts or blackouts. This is so because retail stores doors are often propped open on the hottest summer days, when citywide energy demand is already peaking. For example, our survey found that some retail businesses in Chelsea had their doors open on July 20, when the temperature here climbed above 90 degrees. On that day, due to a near record demand for electricity, more than 19,000 households on Staten Island lost power, with scattered outages elsewhere in the city. And to meet high energy demand on such scorching days, utilities like Con Edison are forced to rely upon peak-power fossil-fuel plants; these plants are expensive to fire up and they produce more pollution and global warming emissions than modern power generators. ….businesses that prop their doors open during the summer months can increase their electricity bills up to $1,000. With such concerns in mind, the New York City Council — spearheaded by then Councilmember and now Manhattan Borough President Gale Brewer — passed legislation in 2008 designed to address the problem. Local Law 38 of 2008 makes it unlawful to keep the exterior door of a commercial building open while an air conditioner or central cooling system is operating and cooling the area adjacent to such door (except, of course, when people are entering and exiting). This legislative gap, combined with generally weak enforcement over the years, has hampered the statute’s effectiveness. Indeed, many of the stores that were identified in the NRDC survey as having open doors and air conditioners operating were businesses that were probably under the 4,000 square feet legal threshold. Earlier this summer, the de Blasio administration unveiled new measures designed to secure greater compliance by retailers with the sensible energy-conserving requirement of Local Law 38 of 2008. 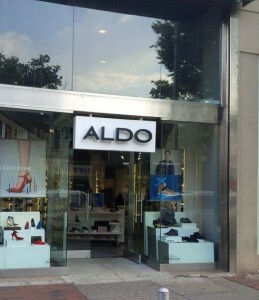 Aldo stores, on Kings Highway near Coney Island Avenue in Brooklyn, as part of a chain with five or more stores in New York City, is require to comply with Local Law 38 of 2008. But its door was wide open, with AC operating, as temperature hit 93 degrees on August 16. First, the Mayor’s Consumer Affairs Commissioner, Julie Menin, launched a new educational campaign that encourages retailers to “Shut the Front Door.” Two hundred volunteers fanned out across the city to visit business corridors. They distributed literature and used social media to remind business owners that they could save money and energy by keeping doors closed while their air conditioners were running. Second, Commissioner Menin announced that the Administration would be working with the City Council to advance legislation aimed at closing the loophole that allows businesses with establishments smaller than 4,000 square feet to ignore the door-closing edict in the 2008 law. This new legislation has now been introduced by two strong friends of the city’s environment — Councilmembers Costa Constantinides and Donovan Richards, the current and immediate past chair of the City Council’s Environmental Protection Committee, respectively. The new bill, Intro 850, would make it unlawful for any commercial building or structure in New York City, regardless of size, to keep open its exterior door while building air conditioners or central cooling systems are operating, beginning June 1, 2016. The bill would also increase fines for violations of this provision and require all chain stores to post notices on the doors of their establishments, informing members of the public how they can report instances of non-compliance to city enforcement agencies. But introducing such legislation is one thing and getting it passed is another. Before the original legislation was enacted in 2008, it was Clyde Haberman – a New York Times metro staff veteran — whose thoughtful columns were instrumental in drawing attention to the issue and building political support for legislative action. Note to Clyde: Please come back for an encore appearance! WORKING TO CURB ENERGY-WASTING IN NYC: Manhattan Borough President Gale Brewer championed passage of Local Law 38; Consumer Affairs Commissioner Julie Menin is seeking greater compliance with Local Law 38; Councilmembers Costa Constantinides and Donovan Richards are co-sponsoring legislation to require all NYC stores, regardless of size, to keep their doors closed, while their air conditioners are blasting. A New York City Council Environmental Protection Committee hearing on the bill has just been scheduled for September 8. If we can’t get this simple and sensible Constaintinides/Richards legislation passed, if we can’t get all city retailers to cooperate in eliminating one of their most audacious energy-wasting practices, how will we ever be able to implement the larger actions necessary to forestall a harrowing climate future? Eric Goldstein is director of NRDC’s New York City Environment. 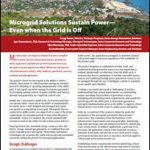 This blog originally appeared on Switchboard, the staff blog of the Natural Resources Defense Council.